Loughborough Town Hall has built up a well-deserved reputation for traditional family panto and this year’s show is one of the best in the region. Nothing better ensures integrity than writing a script that you’re going to have to deliver yourself, and it’s a winning factor that Morgan Brind – writer, designer, co-producer of the show and founder of Little Wolf Entertainment – is playing Widow Twankey. He gets some gloriously wacky costumes but it’s not lavishness or a big budget or technical wizardry that makes this show so good. From the opening silent film sequence that brings the villainous Abanazar racing to the stage, to the slapstick in the Wok A Palarva noodle bar, to the inventive UV carpet ride and the Chinese takeaway song sheet, all the elements here work seamlessly together. And every character has a distinct personality. The Genie has cramp from being inside the lamp and is best mates with the Spirit of the Ring. Dan Smith’s Abanazar is impressively Mongolian, and Paul Lincoln’s well-spoken and robust Emperor of China has a proper part to play. Musical numbers include an exuberant Putting on the Ritz, tapped out in the cave to close Act One. It couldn’t be better. 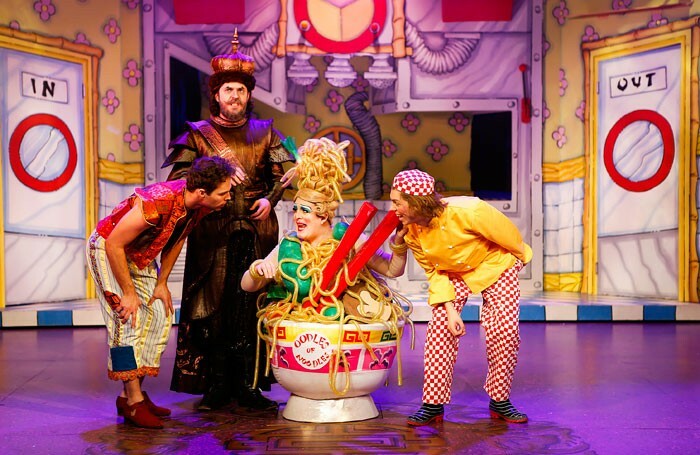 Perfect family panto, the very best of its kind.